SpaceX's Falcon 9 Block 5 rocket lifts off from Kennedy Space Center LC-39A with the Bangabandhu-1 satellite (May 2018). Falcon 9 is a two-stage-to-orbit medium lift launch vehicle designed and manufactured by SpaceX in the United States. It is powered by Merlin engines, also developed by SpaceX, burning liquid oxygen (LOX) and rocket-grade kerosene (RP-1) propellants. Its name is from the Millennium Falcon and the nine engines of the rocket's first stage. The rocket evolved with versions v1.0 (2010–2013), v1.1 (2013–2016), v1.2 "Full Thrust" (2015–2018), and its Block 5 variant, flying since May 2018. Unlike most rockets, which are expendable launch systems, Falcon 9 is partially reusable, with the first stage capable of re-entering the atmosphere and landing back vertically after separating from the second stage. This feat was achieved for the first time on flight 20 with the v1.2 version in December 2015. Falcon 9 can lift payloads of up to 22,800 kilograms (50,300 lb) to low Earth orbit, 8,300 kg (18,300 lb) to geostationary transfer orbit (GTO) when expended, and 5,500 kg (12,100 lb) to GTO when the first stage is recovered. The heaviest GTO payloads were Intelsat 35e with 6,761 kg (14,905 lb), and Telstar 19V with 7,075 kg (15,598 lb), although the latter was launched into a lower-energy GTO orbit achieving an apogee well below the geostationary altitude. In 2008, SpaceX won a Commercial Resupply Services (CRS) contract in NASA's Commercial Orbital Transportation Services (COTS) program to deliver cargo to the International Space Station (ISS) using the Falcon 9 and Dragon capsule. The first mission under this contract launched on October 8, 2012. SpaceX intends to certify the Falcon 9 to be human-rated for transporting NASA astronauts to the ISS as part of the Commercial Crew Development program. The initial Falcon 9 version 1.0 flew five times from June 2010 to March 2013; version 1.1 flew fifteen times from September 2013 to January 2016. The "Full Thrust" version has been in service since December 2015, with several additional upgrades within this version. The latest variant, Block 5, was introduced in May 2018. It features increased engine thrust, improved landing legs, and other minor improvements to help recovery and reuse. The Falcon Heavy derivative, introduced in February 2018, consists of a strengthened Falcon 9 first stage as its center core, attached to two standard Falcon 9 first stages used as boosters. Falcon 9 rocket family; from left to right: Falcon 9 v1.0, v1.1, Full Thrust, Block 5, and Falcon Heavy. As early as October 2005, SpaceX had publicly announced plans to launch Falcon 9 in the first half of 2007. In the event, the first launch would occur in 2010. While SpaceX exclusively spent its own money to develop its previous launcher, the Falcon 1, development of the Falcon 9 was accelerated by NASA funding parts[which?] of development costs and committing to purchase several commercial flights if specific capabilities were demonstrated. This started with seed money from the Commercial Orbital Transportation Services (COTS) program in 2006. The contract was structured as a Space Act Agreement (SAA) "to develop and demonstrate commercial orbital transportation service" including the purchase of three demonstration flights. The overall contract award was US$278 million to provide development funding for Dragon, Falcon 9, and demonstration launches of Falcon 9 with Dragon. In 2011 additional milestones were added, bringing the total contract value to US$396 million. NASA became an anchor tenant for the vehicle in 2008, when they contracted to purchase 12 Commercial Resupply Services launches to the International Space Station, whereby funds would be disbursed only after the initial COTS demonstration missions were completed and deemed successful. The space logistics delivery contract was worth US$1.6 billion for a minimum of 12 missions to carry supplies to and from the station. Musk has repeatedly said that, without the NASA money, development would have taken longer. SpaceX has only come this far by building upon the incredible achievements of NASA, having NASA as an anchor tenant for launch, and receiving expert advice and mentorship throughout the development process. SpaceX would like to extend a special thanks to the NASA COTS office for their continued support and guidance throughout this process. The COTS program has demonstrated the power of a true private/public partnership and we look forward to the exciting endeavors our team will accomplish in the future. In 2011, SpaceX estimated that Falcon 9 v1.0 development costs were on the order of $300 million. NASA evaluated that development costs would have been $3.6 billion if a traditional cost-plus contract approach had been used. In 2014, SpaceX released total combined development costs for both the Falcon 9 and the Dragon capsule. NASA provided US$396 million while SpaceX provided over US$450 million to fund rocket and capsule development efforts. A 2011 NASA report "estimated that it would have cost the agency about US$4 billion to develop a rocket like the Falcon 9 booster based upon NASA's traditional contracting processes" while "a more 'commercial development' approach might have allowed the agency to pay only US$1.7 billion." Congressional testimony by SpaceX in 2017 suggested that the unusual NASA process of "setting only a high-level requirement for cargo transport to the space station [while] leaving the details to industry" had allowed SpaceX to design and develop the Falcon 9 rocket on its own at substantially lower cost. "According to NASA's own independently verified numbers, SpaceX's development costs of both the Falcon 1 and Falcon 9 rockets were estimated at approximately US$390 million in total." SpaceX originally intended to follow its light Falcon 1 launch vehicle with an intermediate capacity vehicle, the Falcon 5. In 2005, SpaceX announced it was instead proceeding with development of the Falcon 9, a "fully reusable heavy lift launch vehicle", and had already secured a government customer. The Falcon 9 was described as being capable of launching approximately 9,500 kg (21,000 lb) to low Earth orbit, and was projected to be priced at $27 million per flight with a 3.7 m (12 ft) fairing and $35 million with a 5.2 m (17 ft) fairing. SpaceX also announced development of a heavy version of the Falcon 9 with a payload capacity of approximately 25,000 kg (55,000 lb). The Falcon 9 was intended to enable launches to LEO, GTO, as well as both crew and cargo vehicles to the ISS. The original NASA COTS contract called for the first demonstration flight of Falcon in September 2008, and completion of all three demonstration missions by September 2009. In February 2008, the plan for the first Falcon 9/Dragon COTS Demo flight was delayed by six months to late in the first quarter of 2009. According to Elon Musk, the complexity of the development work and the regulatory requirements for launching from Cape Canaveral contributed to the delay. The first multi-engine test (with two engines connected to the first stage, firing simultaneously) was successfully completed in January 2008, with successive tests leading to the full Falcon 9 complement of nine engines test fired for a full mission length (178 seconds) of the first stage in November 2008. In October 2009, the first flight-ready first stage had a successful all-engine test fire at the company's test stand in McGregor, Texas. In November 2009 SpaceX conducted the initial second stage test firing lasting forty seconds. This test succeeded without aborts or recycles. In January 2010, a full-duration (329 seconds) orbit-insertion firing of the Falcon 9 second stage was conducted at the McGregor test site. The full stack arrived at the launch site for integration at the beginning of February 2010, and SpaceX initially scheduled a launch date of March 2010, though they estimated anywhere between one and three months for integration and testing. In February 2010, SpaceX's first flight stack was set vertical at Space Launch Complex 40, Cape Canaveral, and on March 9, SpaceX performed a static fire test, where the first stage was to be fired without taking off. The test aborted at T−2 seconds due to a failure in the system designed to pump high-pressure helium from the launch pad into the first stage turbopumps, which would get them spinning in preparation for launch. Subsequent review showed that the failure occurred when a valve did not receive a command to open. As the problem was with the pad and not with the rocket itself, it didn't occur at the McGregor test site, which did not have the same valve setup. Some fire and smoke were seen at the base of the rocket, leading to speculation of an engine fire. However, the fire and smoke were the result of normal burnoff from the liquid oxygen and fuel mix present in the system prior to launch, and no damage was sustained by the vehicle or the test pad. All vehicle systems leading up to the abort performed as expected, and no additional issues were noted that needed addressing. A subsequent test on March 13 was successful in firing the nine first-stage engines for 3.5 seconds. In December 2010, the SpaceX production line was manufacturing one Falcon 9 (and Dragon spacecraft) every three months, with a plan to double the rate to one every six weeks. By September 2013, SpaceX total manufacturing space had increased to nearly 1,000,000 sq ft (93,000 m2) and the factory had been configured to achieve a maximum production rate of 40 rocket cores per year. The factory was producing one Falcon 9 vehicle per month as of November 2013. The company planned to increase to 18 vehicles per year in mid-2014, 24 per year by the end of 2014, and 40 rocket cores per year by the end of 2015. These production rates were not achieved by February 2016 as previously planned; the company indicated that production rate for Falcon 9 cores had only recently increased to 18 per year, and the number of first stage cores that can be assembled at one time had doubled from three to six. The production rate was expected to grow to 30 cores per year by the end of 2016, but as of August 2016[update], SpaceX was working towards a production capacity of 40 cores per year, the full factory capacity envisioned in 2013. 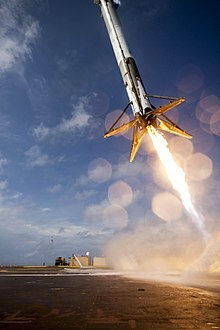 Rockets from the Falcon 9 family have been launched 70 times over 9 years, resulting in 68 full mission successes (97.1%), one partial success (CRS-1 delivered its cargo to the ISS, but a secondary payload was stranded in a lower-than-planned orbit), and one failure (the CRS-7 spacecraft was lost in flight). Additionally, one rocket and its payload Amos-6 were destroyed before launch in preparation for an on-pad static fire test. The first rocket version Falcon 9 v1.0 was launched 5 times from June 2010 to March 2013, its successor Falcon 9 v1.1 15 times from September 2013 to January 2016, and the latest upgrade Falcon 9 Full Thrust 49 times from December 2015 to present, 18 of which using a re-flown first stage booster. Falcon Heavy was launched once in February 2018, incorporating two refurbished first stages as side boosters. The final "Block 4" booster to be produced was flown in April 2018, and the first Block 5 version in May. While Block 4 boosters were only ever flown twice and required several months of refurbishment, Block 5 versions are designed to sustain 10 flights with just inspections, possibly on a 24-hour turnover. The rocket's first-stage boosters have been recovered in 38 of 45 landing attempts (84%). Flight 58, Telstar 19V, heaviest communication satellite to GEO delivered to date. Flight 64, SSO-A, first time Falcon 9 booster flown three times. Interactive 3D model of the Falcon 9, fully integrated on the left and in exploded view on the right. The Falcon 9 is a two-stage, LOX/RP-1-powered heavy-lift launch vehicle. Both stages are equipped with Merlin 1D rocket engines; nine sea-level adapted versions on the first stage and one vacuum adapted version on the second stage. Every engine utilises a pyrophoric mixture of triethylaluminum-triethylborane (TEA-TEB) as an engine igniter. The first stage engines are arranged in a structural form SpaceX calls "Octaweb". Many cores include four extensible landing legs attached around the base of the Octaweb. To control the descent of the boosters and center core through the atmosphere, SpaceX often uses grid fins which deploy from the vehicle after separation. The legs will then deploy as the boosters return to Earth, landing each softly on the ground. The propellant tank walls and domes are made from aluminum-lithium alloy. SpaceX uses an all friction-stir welded tank, the highest strength and most reliable welding technique available. The second stage tank of a Falcon 9 is simply a shorter version of the first stage tank and uses most of the same tooling, material, and manufacturing techniques, reducing production costs. The Falcon 9 interstage, which connects the upper and lower stage, is a carbon-fiber aluminum-core composite structure. Reusable separation collets and a pneumatic pusher system separates the stages. The original design stage separation system had twelve attachment points, which was reduced to just three in the v1.1 launcher. The Falcon 9 uses a payload fairing to protect (non-Dragon) satellites during launch. The fairing is 13 m (43 ft) long, 5.2 m (17 ft) in diameter, weighs approximately 1,900 kg, and is constructed of carbon fiber skin overlaid on an aluminum honeycomb core. SpaceX designed and fabricates fairings at their headquarters in Hawthorne, California. Testing of the design was completed at NASA's Plum Brook Station facility in spring 2013 where the acoustic shock and mechanical vibration of launch, plus electromagnetic static discharge conditions, were simulated on a full-size test article in a very large vacuum chamber. SpaceX uses multiple redundant flight computers in a fault-tolerant design. Each Merlin rocket engine is controlled by three voting computers, each of which has two physical processors that constantly check each other. The software runs on Linux and is written in C++. For flexibility, commercial off-the-shelf parts and system-wide radiation-tolerant design are used instead of rad-hardened parts. Each stage has stage-level flight computers, in addition to the Merlin-specific engine controllers, of the same fault-tolerant triad design to handle stage control functions. The original Falcon 9 v1.0 flew five successful orbital launches in 2010–2013. The much larger Falcon 9 v1.1 made its first flight in September 2013. The demonstration mission carried a very small 500 kg (1,100 lb) primary payload, the CASSIOPE satellite; larger payloads followed for v1.1, starting with the launch of the large SES-8 GEO communications satellite. Both Falcon 9 v1.0 and Falcon 9 v1.1 were expendable launch vehicles (ELVs). The Falcon 9 Full Thrust made its first flight in December 2015. The first stage of the Falcon 9 Full Thrust version is reusable. The current version, known as Falcon 9 Block 5, made its first flight in May 2018. A Falcon 9 v1.0 launches with a Dragon spacecraft delivering cargo to the ISS in 2012. The first version of the Falcon 9 launch vehicle, Falcon 9 v1.0, was an expendable launch vehicle that was developed in 2005–2010, and was launched for the first time in 2010. Falcon 9 v1.0 made five flights in 2010–2013, after which it was retired. The Falcon 9 v1.0 first stage was powered by nine SpaceX Merlin 1C rocket engines arranged in a 3×3 pattern. Each of these engines had a sea-level thrust of 556 kN (125,000 pounds-force) for a total thrust on liftoff of about 5,000 kN (1,100,000 pounds-force). The Falcon 9 v1.0 second stage was powered by a single Merlin 1C engine modified for vacuum operation, with an expansion ratio of 117:1 and a nominal burn time of 345 seconds. Gaseous N2 thrusters were used on the Falcon 9 v1.0 second-stage as a reaction control system. SpaceX expressed hopes initially that both stages would eventually be reusable. But early results from adding lightweight thermal protection system capability to the booster stage and using parachute recovery were not successful, leading to abandonment of that approach and the initiation of a new design. In 2011, SpaceX began a formal and funded development program for a reusable Falcon 9, with the early program focus however on return of the first stage. The Falcon 9 v1.1 ELV is a 60 percent heavier rocket with 60 percent more thrust than the v1.0 version of the Falcon 9. It includes realigned first-stage engines and 60 percent longer fuel tanks, making it more susceptible to bending during flight. Development testing of the v1.1 first stage was completed in July 2013. The Falcon 9 v1.1, first launched in September 2013, uses a longer first stage powered by nine Merlin 1D engines arranged in an "octagonal" pattern, that SpaceX calls Octaweb. This is designed to simplify and streamline the manufacturing process. The v1.1 first stage has a total sea-level thrust at liftoff of 5,885 kN (1,323,000 lbf), with the nine engines burning for a nominal 180 seconds, while stage thrust rises to 6,672 kN (1,500,000 lbf) as the booster climbs out of the atmosphere. The engines have been upgraded to the more powerful Merlin 1D. These improvements increased the payload capability from 9,000 kg (20,000 lb) to 13,150 kg (28,990 lb). The stage separation system has been redesigned and reduces the number of attachment points from twelve to three, and the vehicle has upgraded avionics and software as well. Following the September 2013 launch, the second stage igniter propellant lines were insulated to better support in-space restart following long coast phases for orbital trajectory maneuvers. SpaceX President Gwynne Shotwell has stated the Falcon 9 v1.1 has about 30 percent more payload capacity than published on its standard price list, the extra margin reserved for returning of stages via powered re-entry. Four extensible carbon fiber with aluminum honeycomb landing legs were included on later flights where landings were attempted. The "Full Thrust upgrade" version — the third major version of the Falcon 9 launch vehicle following the Falcon 9 v1.0 (launched 2010–2013) and the Falcon 9 v1.1 (launched 2013 – January 2016) — has cryogenic cooling of propellant to increase density allowing 17% higher thrust, an improved stage separation system, a stretched upper stage that can hold additional propellant, and strengthened struts for holding helium bottles believed to have been involved with the failure of flight 19. SpaceX pricing and payload specifications published for the Falcon 9 v1.1 rocket as of March 2014[update] actually included about 30 percent more performance than the published price list indicated; the additional performance was reserved for SpaceX to perform reusability testing with the Falcon 9 v1.1 while still achieving the specified payloads for customers. Many engineering changes to support reusability and recovery of the first stage had been made on the v1.1 version and testing was successful, with SpaceX able to increase the payload performance for the Full Thrust version, or decrease launch price, or both. The Full Thrust version of the rocket has a reusable first stage after achieving its first successful landing in December 2015 and first reflight in March 2017. However, plans to reuse the Falcon 9 second-stage booster have been abandoned as the weight of a heat shield and other equipment would impinge on payload too much for this to be economically feasible for this rocket. The reusable booster stage was developed using systems and software tested on the Grasshopper and F9R Dev technology demonstrators, as well as a set of technologies being developed by SpaceX to facilitate rapid reusability. In February 2017, SpaceX's CRS-10 launch was the first operational launch utilizing the new Autonomous Flight Safety System (AFSS) that is built into Falcon 9 Full Thrust launch vehicles. For all SpaceX launches after 16 March 2017, the autonomous AFSS has replaced "the ground-based mission flight control personnel and equipment with on-board Positioning, Navigation and Timing sources and decision logic. The benefits of AFSS include increased public safety, reduced reliance on range infrastructure, reduced range spacelift cost, increased schedule predictability and availability, operational flexibility, and launch slot flexibility." On the June 25, 2017 mission carrying the second batch of ten Iridium NEXT satellites, aluminum grid fins were replaced by titanium versions, to improve control authority and better cope with heat during re-entry. In 2017, SpaceX started including incremental changes to the Falcon 9 Full Thrust, internally calling it the "Block 4" version. Initially only the second stage was modified to Block 4 standards, flying on top of a "Block 3" first stage for three missions: NROL-76 and Inmarsat-5 F4 in May 2017, and Intelsat 35e in July. Block 4 was described as a transition between the Full Thrust v1.2 "Block 3" and Block 5. It includes incremental engine thrust upgrades leading to the final thrust for Block 5. The maiden flight of the full Block 4 design (first and second stages) was the NASA CRS-12 mission on August 14, 2017. In October 2016, Musk described a Block 5 version that would have "a lot of minor refinements that collectively are important, but uprated thrust and improved legs are the most significant." In January 2017, Musk added that the Block 5 version "significantly improves performance & ease of reusability". He described this version as the "final" version of the rocket. The maiden flight took place on May 11, 2018, with the Bangabandhu-1 satellite. The Block 5 version of the second stage includes upgrades that enables it to operate for longer in orbit and reignite its engine three or more times. ^ a b One rocket and payload were destroyed before launch, during preparation for a routine static fire test. ^ The Falcon 9 v1.0 only launched the Dragon spacecraft; it was never launched with the clam-shell payload fairing. ^ Payload was restricted to 10,886 kg (24,000 lb) due to structural limit of the payload adapter fitting (PAF). ^ On SpaceX CRS-1, the primary payload, Dragon, was successful. A secondary payload was placed in an incorrect orbit because of a changed flight profile due to the malfunction and shut-down of a single first-stage engine. Likely enough fuel and oxidizer remained on the second stage for orbital insertion, but not enough to be within NASA safety margins for the protection of the International Space Station. ^ The only failed mission of the Falcon 9 v1.1 was SpaceX CRS-7, which was lost during its first stage operation due to an overpressure event in the second stage oxygen tank. SpaceX had predicted that its launches would have high reliability based on the philosophy that "through simplicity, reliability and low cost can go hand-in-hand" by 2011. As of 2 March 2019[update] Falcon 9 has achieved 67 out of 69 primary missions, with one rocket destroyed in flight and one on the launch pad during fueling for an engine test, yielding a success rate of 97.1%. For comparison, present industry benchmark, the Russian Soyuz series has performed more than 1,700 launches with a success rate of 97.4%. As with the company's smaller Falcon 1 vehicle, Falcon 9's launch sequence includes a hold-down feature that allows full engine ignition and systems check before liftoff. After first-stage engine start, the launcher is held down and not released for flight until all propulsion and vehicle systems are confirmed to be operating normally. Similar hold-down systems have been used on other launch vehicles such as the Saturn V and Space Shuttle. An automatic safe shut-down and unloading of propellant occurs if any abnormal conditions are detected. Prior to the launch date, SpaceX always completes a test of the Falcon 9 culminating in a firing of the first stage's Merlin 1D engines for three-and-a-half seconds to verify performance. Falcon 9 has triple redundant flight computers and inertial navigation, with a GPS overlay for additional orbit insertion accuracy. Like the Saturn rocket series from the Apollo program, the presence of multiple first-stage engines allows for mission completion even if one of the first-stage engines fails during flight. Detailed descriptions of several aspects of destructive engine failure modes and designed-in engine-out capabilities were made public by SpaceX in a 2007 "update" that was publicly released. SpaceX emphasized over several years that the Falcon 9 first stage is designed for engine out capability. The SpaceX CRS-1 mission in October 2012 was a partial success after an engine failure in the first stage: engine no. 1 experienced a loss of pressure at 79 seconds, and then shut down. To compensate for the resulting loss of acceleration, the first stage had to burn 28 seconds longer than planned, and the second stage had to burn an extra 15 seconds. That extra burn time of the second stage reduced its fuel reserves, so that the likelihood that there was sufficient fuel to reach the planned orbit above the space station with the secondary payload dropped from 99% to 95%. Because NASA had purchased the launch and therefore contractually controlled a number of mission decision points, NASA declined SpaceX's request to restart the second stage and attempt to deliver the secondary payload into the correct orbit. This risk was understood by the secondary payload customer at time of the signing of the launch contract. As a result, the secondary payload satellite reentered the atmosphere a few days after launch. SpaceX intended to recover the first stages of several early Falcon flights to assist engineers in designing for future reusability. They were equipped with parachutes but failed to survive the aerodynamic stress and heating during atmospheric re-entry following stage separation. Although reusability of the second stage is more difficult, SpaceX intended from the beginning to make both stages of the Falcon 9 reusable. Both stages in the early launches were covered with a layer of ablative cork and had parachutes to land them gently in the sea. The stages were also marinized by salt-water corrosion resistant material, anodizing and paying attention to galvanic corrosion. Musk said that if the vehicle does not become reusable, "I will consider us to have failed." In late 2011, SpaceX announced a change in the approach, eliminating the parachutes and going with a propulsively-powered-descent approach. Included was a video said to be an approximation depicting the first stage returning tail-first for a powered descent and the second stage, with heat shield, reentering head first before rotating for a powered descent. Design was complete on the system for "bringing the rocket back to launchpad using only thrusters" by February 2012. A reusable first stage was then flight-tested by SpaceX with the suborbital Grasshopper rocket. Between 2012 and 2013, this low-altitude, low-speed demonstration test vehicle made eight VTVL test flights, including a 79-second round-trip flight to an altitude of 744 m (2,441 ft). In March 2013, SpaceX announced that, beginning with the first flight of the Falcon 9 v1.1 (the sixth flight overall of Falcon 9), every first stage would be instrumented and equipped as a controlled descent test vehicle. SpaceX continued their propulsive-return over-water tests, saying they "will continue doing such tests until they can do a return to the launch site and a powered landing. ... [SpaceX] expect several failures before they 'learn how to do it right.'" Falcon 9 Flight 17's first stage attempting a controlled landing on the Autonomous Spaceport Drone Ship following the launch of CRS-6 to the ISS in April 2015. For Falcon 9 Flight 6 in September 2013, after stage separation, the flight test plan called for the first-stage booster to first burn to reduce its reentry velocity, and then effect a second burn just before it reached the water. SpaceX stated they expected several powered-descent tests to achieve successful recovery, before they could then attempt a landing on a solid surface. Although not a complete success, the stage was able to change direction and make a controlled entry into the atmosphere. During the final landing burn, the ACS thrusters could not overcome an aerodynamically induced spin, and centrifugal force deprived the landing engine of fuel leading to early engine shutdown and a hard splashdown that destroyed the first stage. After four more ocean landing tests, the first stage of the CRS-5 launch vehicle attempted a landing on a floating landing platform, the "Autonomous Spaceport Drone Ship" (ASDS) in January 2015. The rocket incorporated (for the first time in an orbital mission) grid fin aerodynamic control surfaces, and guided itself to the ship successfully, but ran out of hydraulic fluid and lost its steering ability, destroying it on impact with the landing platform. A second attempt to land on a floating platform occurred in April 2015, on CRS-6. After the launch, Elon Musk communicated that the bipropellant valve had become stuck, and therefore the control system could not react rapidly enough for a successful landing. The first attempt to land the first stage of Falcon 9 on a ground pad near the launch site occurred on flight 20, the maiden flight of the Falcon 9 Full Thrust version in December 2015. The landing was successful and the first stage was recovered. This was the first time in history that a rocket first stage returned to Earth after propelling an orbital launch mission and achieving a controlled vertical landing. The first successful first-stage landing on an ASDS occurred in April 2016 on the drone ship Of Course I Still Love You during the CRS-8 mission. In total, sixteen test flights were conducted from 2013 to 2016, six of which achieved a soft landing and recovery of the booster. Since January 2017, SpaceX has stopped referring to landing attempts as "experimental" in their press releases, indicating that they are now considered a routine procedure; with the exceptions of the center core from the Falcon Heavy Test Flight and the CRS-16 resupply mission every landing attempt since has been successful. The first operational re-use of a previously-flown Falcon 9 booster was successfully accomplished in March 2017 with B1021 on the SES-10 mission after CRS-8 in April 2016. The booster landed a second time and was retired. In June 2017, booster B1029 helped carry BulgariaSat-1 towards GTO after an Iridium NEXT LEO mission in January, again achieving the reuse and second landing of a recovered booster. A third flight of a flight-proven booster was performed in November 2018 on the SSO-A mission. The core for the mission, B1046, was the first Block 5 booster produced, and was originally flown on the Bangabandhu-1 mission. Despite public statements that they would endeavor to make the Falcon 9 second-stage reusable as well, by late 2014, SpaceX determined that the mass needed for a re-entry heat shield, landing engines, and other equipment to support recovery of the second stage was at that time prohibitive, and indefinitely suspended their second-stage reusability plans for the Falcon line. However, in 2017 they indicated that they might do experimental tests on recovering one or more second-stages in order to learn more about reusability to inform their new, much-larger, Starship and Super Heavy launch vehicle development process. Elon Musk announced April 15, 2018 that the company will be returning a second stage of a future Falcon 9 mission using "a giant party balloon". Payload fairings have survived descent and splashdown in the Pacific Ocean. In June 2015, wreckage of an unidentified Falcon 9 launch vehicle was found off the coast of The Bahamas, which was confirmed by SpaceX CEO Elon Musk to be a component of the payload fairing that washed ashore. Musk noted the possibility of fairing reusability in a statement: "This is helpful for figuring out fairing reusability." In March 2017, SpaceX for the first time recovered a fairing from the SES-10 mission, aided by thrusters and a steerable parachute helping it glide towards a gentle touchdown on water. On April 11, 2019, SpaceX recovered fairing during the Arabsat-6A mission. Following stage separation, the fairing pieces were ejected a few minutes later and made their way down to Earth. The pieces landed in the Atlantic ocean intact and were recovered by the SpaceX recovery teams. Following recovery, Elon Musk tweeted that the fairing were successfully recovered and were going to be refurbished for a Starlink launch. In November 2018, SpaceX announced work on a heavily modified Falcon 9 second stage that would be used for atmospheric reentry testing of a number of technologies needed for the full-scale Starship and Super Heavy, including an ultra-light heat shield and high-Mach control surfaces. Musk indicated it would be "upgraded to be like a mini-BFR ship" but that the stage would not be used for landing tests, as the company already believes it has a good handle on propulsive landings. The first test flight of the modified stage is planned to be no earlier than mid-2019. It is not clear that the stage is intended to be reusable, and appears to be used only for atmospheric flight testing. SpaceX's Falcon 9 rocket delivered the ABS 3A and EUTELSAT 115 West B satellites to a supersynchronous transfer orbit, launching from Space Launch Complex 40 at Cape Canaveral Air Force Station, Florida in March 2015. As of January 2018[update], the Falcon 9 has launched from three orbital launch sites: Launch Complex 39A of the Kennedy Space Center, Space Launch Complex 4E of the Vandenberg Air Force Base, and Space Launch Complex 40 at Cape Canaveral Air Force Station; the latter was damaged in the Amos-6 accident in September 2016, but is operational again since December 2017. SpaceX is also building a commercial-only launch facility at the Boca Chica site near Brownsville, Texas, which will not be used for Falcon 9. At the time of the rocket's maiden flight in 2010, the price of a Falcon 9 v1.0 launch was listed from $49.9 to $56 million. By 2012, the listed price range had increased to $54–$59.5 million. In August 2013, the initial list price for a Falcon 9 v1.1 was $56.5 million; it was raised to $61.2 million by June 2014. Since May 2016, the standard price for a Falcon 9 Full Thrust mission (allowing booster recovery) is published as $62 million. Dragon cargo missions to the ISS have an average cost of $133 million under a fixed price contract with NASA, including the cost of the capsule. The DSCOVR mission, also launched with Falcon 9 for NOAA, cost $97 million. In 2004, Elon Musk stated, "long term plans call for development of a heavy lift product and even a super-heavy, if there is customer demand. [...] Ultimately, I believe $500 per pound ($1100/kg) [of payload delivered to orbit] or less is very achievable." At its 2016 launch price and at full LEO payload capacity, a Falcon 9 FT launch costs just over $2,700 per kilogram ($1,200/lb) when expended. In 2011, Musk estimated that fuel and oxidizer for the Falcon 9 v1.0 rocket cost a total of about $200,000. The first stage uses 245,620 L (64,885 US gal) of liquid oxygen and 146,020 L (38,575 US gal) of RP-1 fuel, while the second stage uses 28,000 L (7,300 US gal) of liquid oxygen and 17,000 L (4,600 US gal) of RP-1. By 2018, the Falcon 9's decreased launch costs has led to competitors developing new rockets. Arianespace is working on Ariane 6, ULA on Vulcan, and ILS on Proton Medium. Falcon 9 payload services include secondary and tertiary payload connection via an EELV Secondary Payload Adapter ring, the same interstage adapter first used for launching secondary payloads on US DoD missions that use the Evolved Expendable Launch Vehicles (EELV) Atlas V and Delta IV. This enables secondary and even tertiary missions with minimal impact to the original mission. In 2011, SpaceX announced pricing for ESPA-compatible payloads on the Falcon 9. ^ a b c d e f g h i "Capabilities & Services (2016)". SpaceX. November 28, 2012. Retrieved May 3, 2016. ^ "Musk: 100 Launches Per Falcon 9 Block 5 Booster is Possible". Parabolic Arc. Archived from the original on July 19, 2018. Retrieved April 13, 2018. ^ a b c d e f g h i j k "Falcon 9 (2015)". SpaceX. November 16, 2012. Archived from the original on December 9, 2015. Retrieved December 3, 2015. ^ a b c d e f g h i j k l m n o p "Falcon 9 (2013)". SpaceX. November 16, 2012. Archived from the original on November 29, 2013. Retrieved December 4, 2013. ^ a b c d e f g h i j k l m n o p q "Falcon 9 Overview (2010)". SpaceX. Archived from the original on December 22, 2010. Retrieved May 8, 2010. ^ Seemangal, Robin (May 4, 2018). "SpaceX Test-Fires New Falcon 9 Block 5 Rocket Ahead of Maiden Flight (Updated)". Popular Mechanics. Retrieved February 2, 2019. ^ a b de Selding, Peter B. (October 15, 2012). "Orbcomm Craft Launched by Falcon 9 Falls out of Orbit". Space News. Retrieved October 15, 2012. Orbcomm requested that SpaceX carry one of their small satellites (weighing a few hundred pounds, vs. Dragon at over 12,000 pounds)... The higher the orbit, the more test data [Orbcomm] can gather, so they requested that we attempt to restart and raise altitude. NASA agreed to allow that, but only on condition that there be substantial propellant reserves, since the orbit would be close to the space station. It is important to appreciate that Orbcomm understood from the beginning that the orbit-raising maneuver was tentative. They accepted that there was a high risk of their satellite remaining at the Dragon insertion orbit. SpaceX would not have agreed to fly their satellite otherwise, since this was not part of the core mission and there was a known, material risk of no altitude raise. ^ a b Graham, William (December 21, 2015). "SpaceX returns to flight with OG2, nails historic core return". NASASpaceFlight. Retrieved December 22, 2015. The launch also marked the first flight of the Falcon 9 Full Thrust, internally known only as the "Upgraded Falcon 9"
^ Graham, Will. "SpaceX successfully launches debut Falcon 9 v1.1". NASASpaceFlight. Retrieved September 29, 2013. ^ "Detailed Mission Data – Falcon-9 ELV First Flight Demonstration". Mission Set Database. NASA GSFC. Archived from the original on October 16, 2011. Retrieved May 26, 2010. ^ "Falcon 9 (2016)". SpaceX. November 16, 2012. Archived from the original on July 15, 2013. Retrieved 3 May 2016. ^ a b "Falcon 9". SpaceX. November 16, 2012. Archived from the original on May 1, 2013. Retrieved September 29, 2013. ^ "SpaceX Falcon 9 Upper Stage Engine Successfully Completes Full Mission Duration Firing" (Press release). SpaceX. March 10, 2009. ^ a b c Ananian, C. Scott (October 24, 2014). Elon Musk MIT Interview. Event occurs at 14:20. Retrieved July 16, 2017 – via YouTube. ^ a b Barbara Opall-Rome (October 12, 2015). "IAI Develops Small, Electric-Powered COMSAT". DefenseNews. Retrieved October 12, 2015. At 5.3 tons, Amos-6 is the largest communications satellite ever built by IAI. Scheduled for launch in early 2016 from Cape Canaveral aboard a Space-X Falcon 9 launcher, Amos-6 will replace Amos-2, which is nearing the end of its 16-year life. ^ Amos, Jonathan (October 8, 2012). "SpaceX lifts off with ISS cargo". BBC News. Retrieved June 3, 2018. ^ a b Cooper, Ben (April 25, 2018). "Rocket Launch Viewing Guide for Cape Canaveral". Launchphotography.com. Retrieved May 2, 2018. ^ SpaceX reveals Falcon 1 Halloween date, 10 October 2005, accessed 31 January 2019. ^ David J. Frankel (April 26, 2010). "Minutes of the NAC Commercial Space Committee" (PDF). NASA. Retrieved June 24, 2017. ^ a b "COTS 2006 Demo Competition". NASA. January 18, 2006. Retrieved June 24, 2017. ^ "Space Exploration Technologies (SpaceX)". NASA. Retrieved June 24, 2017. ^ "Statement of William H. Gerstenmaier Associate Administrator for Space Operations before the Committee on Science, Space and Technology Subcommittee on Space and Aeronautics U.S. House of Representatives" (PDF). U.S. House of Representatives. May 26, 2011. Retrieved January 26, 2016. ^ a b SpaceX (December 15, 2010). "SpaceX's Dragon spacecraft successfully re-enters from orbit" (Press release). Retrieved October 2, 2014. ^ Money, Stewart (March 12, 2012). "Competition and the future of the EELV program (part 2)". The Space Review. Retrieved October 2, 2014. "The government is the necessary anchor tenant for commercial cargo, but it's not sufficient to build a new economic ecosystem," says Scott Hubbard, an aeronautics researcher at Stanford University in California and former director of NASA's Ames Research Center in Moffett Field, California. ^ SpaceX (December 23, 2008). "NASA selects SpaceX's Falcon 9 booster and Dragon spacecraft for cargo resupply" (Press release). Retrieved March 31, 2017. ^ "THE FACTS ABOUT SPACEX COSTS". spacex.com. May 4, 2011. Archived from the original on March 28, 2013. ^ "Falcon 9 Launch Vehicle NAFCOM Cost Estimates" (PDF). nasa.gov. August 2011. ^ a b "SpaceX goes there—seeks government funds for deep space". Ars Technica, July 13, 2017. ^ a b David, Leonard. "SpaceX tackles reusable heavy launch vehicle". MSN. MSNBC. ^ "SpaceX Announces the Falcon 9 Fully Reusable Heavy Lift Launch Vehicle" (Press release). SpaceX. September 8, 2005. Archived from the original on August 15, 2008. ^ "Space Act Agreement between NASA and Space Exploration Technologies, Inc., for Commercial Orbital Transportation Services Demonstration" (PDF). NASA. May 30, 2006. Retrieved June 24, 2017. ^ Coppinger, Rob (February 27, 2008). "SpaceX Falcon 9 maiden flight delayed by six months to late Q1 2009". Flight Global. ^ "SpaceX Conducts First Multi-Engine Firing of Falcon 9 Rocket" (Press release). SpaceX. January 18, 2008. Archived from the original on January 3, 2010. Retrieved March 4, 2010. ^ "SpaceX successfully conducts full mission-length firing of its Falcon 9 launch vehicle" (Press release). SpaceX. November 23, 2008. Archived from the original on February 9, 2009. Retrieved November 24, 2008. ^ "Merlin Vacuum Engine Test". Youtube. November 12, 2010. Retrieved February 23, 2015. ^ "SpaceX announces Falcon 9 assembly underway at the Cape". Orlando Sentinel. February 11, 2010. ^ "Updates". SpaceX. February 25, 2010. Retrieved June 4, 2010. ^ Kremer, Ken (March 13, 2010). "Successful Engine Test Firing for SpaceX Inaugural Falcon 9". Universe Today. Retrieved June 4, 2010. ^ Denise Chow (December 8, 2010). "Q & A with SpaceX CEO Elon Musk: Master of Private Space Dragons". Space.com. Retrieved June 24, 2017. ^ a b "Production at SpaceX". SpaceX. September 24, 2013. Retrieved September 29, 2013. ^ a b Svitak, Amy (November 24, 2013). "Musk: Falcon 9 Will Capture Market Share". Aviation Week. Retrieved November 28, 2013. SpaceX is currently producing one vehicle per month, but that number is expected to increase to '18 per year in the next couple of quarters.' By the end of 2014, she says SpaceX will produce 24 launch vehicles per year. ^ Amos, Jonathan (December 3, 2013). "SpaceX launches SES commercial TV satellite for Asia". BBC News. Retrieved December 11, 2013. The commercial market for launching telecoms spacecraft is tightly contested, but has become dominated by just a few companies – notably, Europe's Arianespace, which flies the Ariane 5, and International Launch Services (ILS), which markets Russia's Proton vehicle. SpaceX is promising to substantially undercut the existing players on price, and SES, the world's second-largest telecoms satellite operator, believes the incumbents had better take note of the California company's capability. ^ Svitak, Amy (March 10, 2014). "SpaceX Says Falcon 9 To Compete For EELV This Year". Aviation Week. Retrieved March 11, 2014. Within a year, we need to get it from where it is right now, which is about a rocket core every four weeks, to a rocket core every two weeks...By the end of 2015, says SpaceX President Gwynne Shotwell, the company plans to ratchet up production to 40 cores per year. ^ a b Foust, Jeff (February 4, 2016). "SpaceX seeks to accelerate Falcon 9 production and launch rates this year". SpaceNews. Retrieved February 6, 2016. ^ Martinez, Domingo (August 2016). "Countdown to Liftoff". Texas Monthly. Retrieved August 19, 2016. ^ Singapore Satellite Industry Forum 2013 - Changing the Launch Game? (video). Singapore Satellite Industry Forum 2013: Cable and Satellite Broadcasting Association of Asia. June 23, 2013. Retrieved April 14, 2018 – via YouTube. ^ Baylor, Michael (May 17, 2018). "With Block 5, SpaceX to increase launch cadence and lower prices". NASASpaceFlight.com. Retrieved July 5, 2018. ^ SpaceX (January 16, 2015). "Close, but no cigar. This time". Vine. Retrieved May 8, 2016. ^ Grush, Loren (March 30, 2017). "SpaceX makes aerospace history with successful launch and landing of a used rocket". The Verge. Retrieved May 2, 2017. ^ a b Lopatto, Elizabeth (March 30, 2017). "SpaceX even landed the nose cone from its historic used Falcon 9 rocket launch". The Verge. Retrieved March 31, 2017. ^ Grush, Loren (May 1, 2017). "SpaceX successfully lands its Falcon 9 rocket after launching military satellite". The Verge. Retrieved May 2, 2017. ^ Jelen, Bill (June 4, 2017). "SpaceX Re-flies Dragon Capsule for CRS-11". We Report Space. Retrieved June 26, 2017. ^ Graham, William (August 14, 2017). "SpaceX Falcon 9 launches CRS-12 Dragon mission to the ISS". NASASpaceFlight.com. Retrieved August 14, 2017. ^ Gebhardt, Chris (July 26, 2017). "TDRS-M given priority over CRS-12 Dragon as launch dates realign". NASASpaceFlight.com. Retrieved July 26, 2017. ^ Grush, Loren (January 9, 2018). "Did SpaceX's secret Zuma mission actually fail?". The Verge. Retrieved January 10, 2018. Rumors started circulating on Monday that the satellite malfunctioned when it reached orbit, and both the Wall Street Journal and Bloomberg have reported that Zuma actually fell back to Earth and burned up in the planet’s atmosphere. […] SpaceX said that the Falcon 9 rocket, which carried Zuma to orbit, performed as it was supposed to. […] "For clarity: after review of all data to date, Falcon 9 did everything correctly on Sunday night," [Gwynne Shotwell] said. “If we or others find otherwise based on further review, we will report it immediately. Information published that is contrary to this statement is categorically false.” She added that the company cannot comment further due to the classified nature of the mission. […] Of course, Northrop Grumman won’t comment on the launch. ^ "SpaceX Falcon 9 sets new record with Telstar 19V launch from SLC-40 – NASASpaceFlight.com". nasaspaceflight.com. Retrieved February 2, 2019. ^ "SpaceX Falcon 9 launches SSO-A multi-sat mission – NASASpaceFlight.com". nasaspaceflight.com. Retrieved February 2, 2019. ^ "Octaweb". SpaceX News. April 12, 2013. Retrieved August 2, 2013. ^ "Landing Legs". SpaceX News. April 12, 2013. Retrieved August 2, 2013. The Falcon Heavy first stage center core and boosters each carry landing legs, which will land each core safely on Earth after takeoff. ^ Kremer, Ken (January 27, 2015). "Falcon Heavy Rocket Launch and Booster Recovery Featured in Cool New SpaceX Animation". Universe Today. Universe Today. Retrieved February 12, 2015. ^ a b c Simberg, Rand (February 8, 2012). "Elon Musk on SpaceX's Reusable Rocket Plans". Popular Mechanics. Retrieved June 24, 2017. ^ a b c d e f Klotz, Irene (September 6, 2013). "Musk Says SpaceX Being "Extremely Paranoid" as It Readies for Falcon 9's California Debut". Space News. Retrieved September 13, 2013. ^ "Falcon 9 Launch Vehicle Information". Spaceflight101. Retrieved October 12, 2018. ^ Mangels, John (May 25, 2013). "NASA's Plum Brook Station tests rocket fairing for SpaceX". Cleveland Plain Dealer. Retrieved May 27, 2013. ^ Chris Forrester (2016). Beyond Frontiers. Broadgate Publications. p. 12. ^ "Falcon 9 Launch Vehicle Payload User's Guide, 2009" (PDF). SpaceX. 2009. Archived from the original (PDF) on April 29, 2011. Retrieved February 3, 2010. ^ Chris Bergen (January 12, 2009). "Musk ambition: SpaceX aim for fully reusable Falcon 9". NASASpaceFlight. Retrieved June 24, 2017. ^ a b "Musk ambition: SpaceX aim for fully reusable Falcon 9". NASAspaceflight.com. January 12, 2009. Retrieved May 9, 2013. With Falcon I's fourth launch, the first stage got cooked, so we’re going to beef up the Thermal Protection System (TPS). By flight six we think it's highly likely we’ll recover the first stage, and when we get it back we’ll see what survived through re-entry, and what got fried, and carry on with the process. That's just to make the first stage reusable, it’ll be even harder with the second stage – that has got to have a full heatshield, it’ll have to have deorbit propulsion and communication. ^ "Falcon 9's commercial promise to be tested in 2013". Spaceflight Now. Retrieved June 24, 2017. ^ Dan Leone (July 16, 2013). "SpaceX Test-fires Upgraded Falcon 9 Core for Three Minutes". Space News. Retrieved June 24, 2017. ^ Bergin, Chris (June 20, 2013). "Reducing risk via ground testing is a recipe for SpaceX success". NASASpaceFlight. Retrieved June 24, 2017. ^ "The Annual Compendium of Commercial Space Transportation: 2012" (PDF). Federal Aviation Administration. February 2013. Retrieved June 24, 2017. ^ Clark, Stephen (May 18, 2012). "Q&A with SpaceX founder and chief designer Elon Musk". SpaceFlightNow. Retrieved June 24, 2017. ^ "Octaweb". SpaceX. July 29, 2013. Retrieved June 24, 2017. ^ de Selding, Peter (March 27, 2014). "SpaceX Says Requirements, Not Markup, Make Government Missions More Costly". SpaceNews. Retrieved June 24, 2017. ^ "Landing Legs". SpaceX. July 29, 2013. Retrieved June 24, 2017. ^ a b c Lindsey, Clark (March 28, 2013). "SpaceX moving quickly towards fly-back first stage". NewSpace Watch. Retrieved March 29, 2013. ^ a b Messier, Doug (March 28, 2013). "Dragon Post-Mission Press Conference Notes". Parabolic Arc. Retrieved March 30, 2013. ^ Shotwell, Gwynne (February 3, 2016). Gwynne Shotwell comments at Commercial Space Transportation Conference. Commercial Spaceflight. Event occurs at 2:43:15–3:10:05. Retrieved February 4, 2016. ^ a b c d e "Falcon 9 Launch Vehicle Payload User's Guide, Rev 2" (PDF). October 21, 2015. Archived from the original (PDF) on March 14, 2017. Retrieved June 24, 2017. ^ Jeff Foust (December 15, 2015). "SpaceX Preparing for Launch of "Significantly Improved" Falcon 9". SpaceNews. Retrieved June 24, 2017. ^ Gwynne Shotwell (March 21, 2014). Broadcast 2212: Special Edition, interview with Gwynne Shotwell (audio file). The Space Show. Event occurs at 08:15–11:20. 2212. Archived from the original (mp3) on March 22, 2014. Retrieved March 22, 2014. ^ Grush, Loren (December 21, 2015). "SpaceX successfully landed its Falcon 9 rocket after launching it to space". The Verge. Retrieved June 24, 2017. ^ James Dean (March 31, 2017). "Reusable Falcon 9 rocket a triumph for SpaceX, Elon Musk". USA Today. Retrieved June 24, 2017. ^ "45th SW supports successful Falcon 9 EchoStar XXIII launch". 45th Space Wing. March 16, 2017. Retrieved June 24, 2017. ^ Elon Musk [@elonmusk] (June 25, 2017). "Flying with larger & significantly upgraded hypersonic grid fins. Single piece cast & cut titanium. Can take reentry heat with no shielding" (Tweet). Retrieved June 25, 2017 – via Twitter. ^ Henry, Caleb (June 29, 2017). "SpaceX's Final Falcon 9 Design Coming This Year, 2 Falcon Heavy Launches in 2018". Space.com. Retrieved June 29, 2017. ^ "SpaceX Falcon 9 v1.2 Data Sheet". Space Launch Report. August 14, 2017. Retrieved August 21, 2017. ^ Gebhardt, Chris (August 16, 2017). "Home Forums L2 Sign Up ISS Commercial Shuttle SLS/Orion Russian European Chinese Unmanned Other Falcon 9 Block 4 debut a success, Dragon arrives for Station berthing". NASASpaceFlight. Retrieved August 16, 2017. ^ "SpaceX Falcon 9 launches CRS-12 Dragon mission to the ISS". NASA Spaceflight.com, August 14, 2017. ^ a b Boyle, Alan (October 23, 2016). "SpaceX's Elon Musk geeks out over Mars interplanetary transport plan on Reddit". GeekWire. Retrieved June 24, 2017. ^ Berger, Eric (January 22, 2017). "SpaceX may be about to launch its final expendable rocket". Ars Technica. Retrieved June 24, 2017. ^ Clark, Stephen (April 24, 2018). "SpaceX set to debut Falcon 9 rocket upgrades with launch next week". Spaceflight Now. ^ Ralph, Eric (June 10, 2018). "SpaceX Falcon Heavy with Block 5 rockets targets November launch debut". teslarati.com. Retrieved February 2, 2019. ^ Kyle, Ed. "SpaceX Falcon 9 v1.2 Data Sheet". www.spacelaunchreport.com. ^ a b Foust, Jeff (August 31, 2015). "SpaceX To Debut Upgraded Falcon 9 on Return to Flight Mission". SpaceNews. Retrieved September 18, 2015. ^ a b c d "Space Launch report, SpaceX Falcon Data Sheet". Retrieved July 29, 2011. ^ "Falcon 9 v1.0 Launch Vehicle". SpaceFlight101. Retrieved June 24, 2017. ^ "Falcon 9 v1.1 & F9R Launch Vehicle Overview". SpaceFlight101. Retrieved June 24, 2017. ^ SpaceX. "Bangabandhu Satellite-1 Mission". Retrieved February 2, 2019 – via YouTube. ^ "Falcon 9 Launch Vehicle Payload User's Guide" (PDF). October 21, 2015. Archived from the original (PDF) on March 14, 2017. Retrieved November 29, 2015. ^ Bergin, Chris (February 8, 2016). "SpaceX prepares for SES-9 mission and Dragon's return". NASA Spaceflight. Retrieved February 9, 2016. The aforementioned Second Stage will be tasked with a busy role during this mission, lofting the 5,300kg SES-9 spacecraft to its Geostationary Transfer Orbit. ^ Clark, Stephen (October 11, 2012). "Orbcomm craft falls to Earth, company claims total loss". Spaceflight Now. Retrieved June 24, 2017. ^ "Inside the $200mn AMOS-6 satellite destroyed during SpaceX rocket explosion (VIDEO, PHOTOS)". RT News. September 1, 2016. ^ "Russia scores success in its 1,700th Soyuz launch". Retrieved October 7, 2012. ^ "Estimating the Reliability of a Soyuz Spacecraft Mission" (PDF). NASA. Figure 2: Historical Rocket Launch Data (Soyuz Rocket Family). Retrieved May 4, 2015. ^ "Hold-Down Arms and Tail Service Masts". NASA. Retrieved June 24, 2017. ^ Clark, Stephen (December 20, 2014). "Falcon 9 completes full-duration static fire". Spaceflight Now. Retrieved May 10, 2015. SpaceX conducts the static fire test — that typically ends with a 3.5-second engine firing — before every launch to wring out issues with the rocket and ground systems. The exercise also helps engineers rehearse for the real launch day. ^ Michael Belfiore (September 1, 2009). "Behind the Scenes With the World's Most Ambitious Rocket Makers". Popular Mechanics. Retrieved June 24, 2017. ^ "Updates: December 2007". Updates Archive. SpaceX. December 2007. Archived from the original on January 4, 2011. Retrieved 2012-12-27. Once we have all nine engines and the stage working well as a system, we will extensively test the "engine out" capability. This includes explosive and fire testing of the barriers that separate the engines from each other and from the vehicle. ... It should be said that the failure modes we’ve seen to date on the test stand for the Merlin 1C are all relatively benign – the turbo pump, combustion chamber and nozzle do not rupture explosively even when subjected to extreme circumstances. We have seen the gas generator (that drives the turbo pump assembly) blow apart during a start sequence (there are now checks in place to prevent that from happening), but it is a small device, unlikely to cause major damage to its own engine, let alone the neighboring ones. Even so, as with engine nacelles on commercial jets, the fire/explosive barriers will assume that the entire chamber blows apart in the worst possible way. The bottom close out panels are designed to direct any force or flame downward, away from neighboring engines and the stage itself. ... we’ve found that the Falcon 9's ability to withstand one or even multiple engine failures, just as commercial airliners do, and still complete its mission is a compelling selling point with customers. Apart from the Space Shuttle and Soyuz, none of the existing  launch vehicles can afford to lose even a single thrust chamber without causing loss of mission. ^ a b Lindsey, Clark S. "Interview* with Elon Musk". HobbySpace. Retrieved June 17, 2010. ^ a b Simburg, Rand. "SpaceX Press Conference". Retrieved June 16, 2010. . Musk quote: "We will never give up! Never! Reusability is one of the most important goals. If we become the biggest launch company in the world, making money hand over fist, but we’re still not reusable, I will consider us to have failed." ^ "Elon Musk says SpaceX will attempt to develop fully reusable space launch vehicle". Washington Post. September 29, 2011. Retrieved October 11, 2011. Both of the rocket's stages would return to the launch site and touch down vertically, under rocket power, on landing gear after delivering a spacecraft to orbit. ^ a b Wall, Mike (September 30, 2011). "SpaceX Unveils Plan for World's First Fully Reusable Rocket". SPACE.com. Retrieved October 11, 2011. ^ "SpaceX Reusable Launch System". ^ National Press Club: The Future of Human Spaceflight Archived September 28, 2013, at the Wayback Machine, cspan, 29 Sep 2011. ^ Boyle, Alan (December 24, 2012). "SpaceX launches its Grasshopper rocket on 12-story-high hop in Texas". MSNBC Cosmic Log. Retrieved December 25, 2012. ^ a b c Graham, William (September 29, 2013). "SpaceX successfully launches debut Falcon 9 v1.1". NASAspaceflight. Archived from the original on September 30, 2013. Retrieved 2013-09-29. ^ Clark, Stephen (January 10, 2015). "Dragon successfully launched, rocket recovery demo crash lands". Retrieved May 5, 2015. ^ Guy Norris (April 16, 2015). "SpaceX Checks Throttle Valve After Flawed Falcon 9 Recovery Attempt". Retrieved June 24, 2017. ^ Wall, Mike (December 21, 2015). "Wow! SpaceX Lands Orbital Rocket Successfully in Historic First". Space.com. Retrieved May 8, 2016. ^ @SpaceX (December 22, 2015). "The Falcon 9 first stage landing is confirmed. Second stage continuing nominally" (Tweet). Retrieved May 8, 2016 – via Twitter. ^ Clark, Stephen (February 18, 2017). "Spaceflight Now — Launch schedule". Spaceflight Now. Retrieved February 20, 2017. ^ Markus Payer (March 30, 2017). "SES-10 launched successfully on SpaceX's flight-proven Falcon 9 rocket" (Press release). SES S.A. Retrieved June 24, 2017. ^ Bart Leahy (April 4, 2017). "Twice-launched Falcon 9 first stage returned to Port Canaveral". SpaceFlight Insider. ^ Clark, Stephen (May 5, 2017). "Bulgaria's first communications satellite to ride SpaceX's second reused rocket". Spaceflight Now. Retrieved May 5, 2017. ^ "Prelaunch Preview: SpaceX | Spaceflight SSO-A". Everyday Astronaut. November 11, 2018. Retrieved December 16, 2018. ^ Russell Borogove (July 31, 2015). "reuse – How does SpaceX plan to achieve reusability of the Falcon 9 *second* stage?". StackExchange. Retrieved January 5, 2016. ^ "Elon Musk on Twitter". Twitter. Retrieved April 16, 2018. ^ Leone, Dan (June 1, 2015). "Beachcomber Finds SpaceX Rocket Wreckage in Bahamas". SpaceNews. Retrieved June 2, 2015. ^ "Both fairing halves recovered. Will be flown on Starlink mission later this year". ^ "SpaceX Poised to Launch from Historic Pad 39A". Smithsonian Air & Space. February 17, 2017. Retrieved February 18, 2017. ^ Bergin, Chris (March 7, 2017). "SpaceX prepares Falcon 9 for EchoStar 23 launch as SLC-40 targets return". NASASpaceFlight. Retrieved March 9, 2017. ^ Chris Gebhardt (April 12, 2017). "Falcon Heavy build up begins; SLC-40 pad rebuild progressing well". NASASpaceFlight. Retrieved June 15, 2017. ^ "SpaceX Is Building a New Launch Site In Texas". Time. August 5, 2014. Retrieved August 9, 2014. ^ "Falcon 9 Overview (2012)". SpaceX. November 16, 2012. Archived from the original on March 23, 2012. Retrieved September 28, 2013. ^ "Capabilities & Services (2013)". SpaceX. November 28, 2012. Archived from the original on August 2, 2013. ^ "Capabilities & Services (2014)". SpaceX. November 28, 2012. Archived from the original on June 7, 2014. ^ "Why the US can beat China: the facts about SpaceX costs". May 4, 2011. Archived from the original on March 28, 2013. ^ "SpaceX books first two launches with U.S. military". December 12, 2012. ^ Testimony of Elon Musk (May 5, 2004). "Space Shuttle and the Future of Space Launch Vehicles". U.S. Senate. ^ "National Press Club: The Future of Human Spaceflight" (Press release). c-span.org. January 14, 2012. Archived from the original on September 28, 2013. ^ "Environmental Assessment, Boost-Back and Landing of the Falcon 9 First Stage at SLC-4 West" (PDF). SpaceX. Archived from the original (PDF) on February 1, 2017. Retrieved April 2, 2018. ^ Ralph, Eric (March 14, 2018). "SpaceX to fly reused rockets on half of all 2018 launches as competition lags far behind". teslarati.com. Retrieved February 2, 2019. ^ Foust, Jeff (August 22, 2011). "New opportunities for smallsat launches". The Space Review. Retrieved September 27, 2011. SpaceX ... developed prices for flying those secondary payloads ... A P-POD would cost between $200,000 and $325,000 for missions to LEO, or $350,000 to $575,000 for missions to geosynchronous transfer orbit (GTO). An ESPA-class satellite weighing up to 180 kilograms would cost $4–5 million for LEO missions and $7–9 million for GTO missions, he said. This page is based on the Wikipedia article Falcon 9; it is used under the Creative Commons Attribution-ShareAlike 3.0 Unported License (CC-BY-SA). You may redistribute it, verbatim or modified, providing that you comply with the terms of the CC-BY-SA.